You've made my day, maybe week! They are perhaps a little understated,but exquisitely beautiful birds on close acquaintance. Thanks for your comments. I think I'd be extremely happy with shots of Pink Robin as 'usable' as this. Brilliant! A lovely post that with your considered words enables the reader to share a priveleged view. It is obvious from the included photos your presence and actions at the scene were accepted by the Pink Robin as non threatening. In contrast I have just read an entry on a popular photo site from a person who states they recently spent four hours following the sounds of a Forty-spotted Pardalote at the Peter Murrell Reserve in order to obtain a photo. Considering that this is an endangered bird and its breeding season is in progress I see these actions as totally irresponsible,and by posting to a public forum worry that other people may see this style as acceptable. I find on my quest of photographing birds that if the situation is not going my way reminding myself how I would feel if I was the bird is an excellent moderator! Photographing birds during my birding outings is a never ending quest for better results, it's one of the things that drives me to take more. As I process the images on my PC, I find that invariably the shots don't live up to my expectations. After all, the 'collected' representation of a bird is a poor substitute for the real thing! Having seen this particular bird at very close range, the results just don't do it justice. It's frustrating. Occasionally I get an image that's better than my average result, but a quick look at some of the great bird images on the internet quickly dispels any feeling of complacency on my part. I know my place! Mmmm! And when I campare many of my shots to ones I see on your blog, I know my place, too!! I think this might be my first comment, though I've been reading along for a while. These shots are astounding! 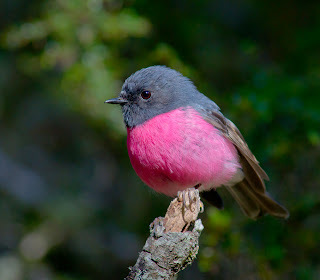 And what a cutie the pink robin is. I very much admire your persistence and am think these photos are lovely: clear and characterful. I never even see a little bird this clearly, let alone manage a photograph. You should see some of my images on an "off" day. We all have our 'triumphs' and 'failures', and I only show my all too infrequent 'triumphs'. All said and down it's really about birds. I hope that the images might entice people to go and look for themselves and realise what 'treasures' they have been missing. And the Pink Robins certainly are "treasures"!! Keep up the inspiration, Alan. oh MY, what a treasure; so eye-catching and appealing. I love the robins though don't have them here at all. I saw a yellow-breasted robin in the Blue Mntns years back; that's the closest encounter...yours is STUNNING. Great photos. wow...absolutely stunning shots, although I can relate to the feeling of being disappointed at the end results after a seemingly serendipitous day of bird watching. Not that I would be disappointed at all with these shots-the light and detail you've captured are superb. As a Gippslander these days myself (I did live in Tassie for around 10 years then inner city Melbourne prior), I too have tried to capture this exquisitely-coloured robin as it is also one of my favourites, but I have yet to get even just one decent shot given the difficulties you described so aptly. Your photos and prose have inspired this enthusiastic amateur however to re-attempt what seemed an impossible task,in the hope that one day, with more experience and Lady Luck to aid me, I will manage to capture just one photo as beautiful as the ones here. 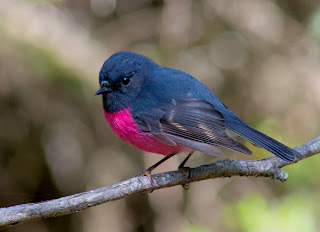 Thank you for the chance to see your work and share in your wonderful Pink Robin birding experience, it truly is a privilege and delight for the viewer! I must admit the subject matter, in this case the Pink Robin male, lends itself to some potentially great images. I suspect that if I had the same shots of the rather drab female, they may have passed unsung! Thank you for your kind comments. I share your exasperation at the actions of some photographers, some even calling themselves birders! Their real interest in birds is minimal.I have thought about these forums at length and I'm coming to the conclusion that by their very nature they're competitive. In that lies the problem. It's amazing what we're all capable of doing in a competitive environment! BTW, did you see my cameo appearance in the ABC's piece? I see you understand the frustrations of bird photography. How many times have I returned in the belief that I have some good shots, only to be brought back to reality on viewing them on the PC! A new "problem" has begun to rear its' head--increasingly I find I can't hold the camera as steady as I once could. Old age is catching up with me. Fortunately, I can still enjoy the birding. Thanks for your comments. I have to admit that I hadn't made the connection. 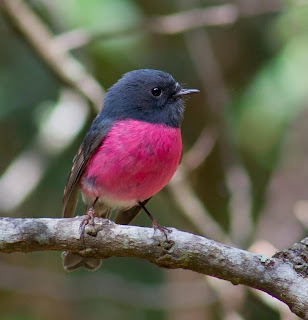 These images of Pink Robin (and some from my pbase site) are widely used by others on the internet--many hundreds of times. Not sure what the ethics are, but I do feel a little flattered that others like them so much.